Asís attended the Escuela Nacional de Bellas Artes (1946-1950), moving then to Paris in 1956, where he had the opportunity to become acquainted with and subscribe to the principles of the Kinetic movement. 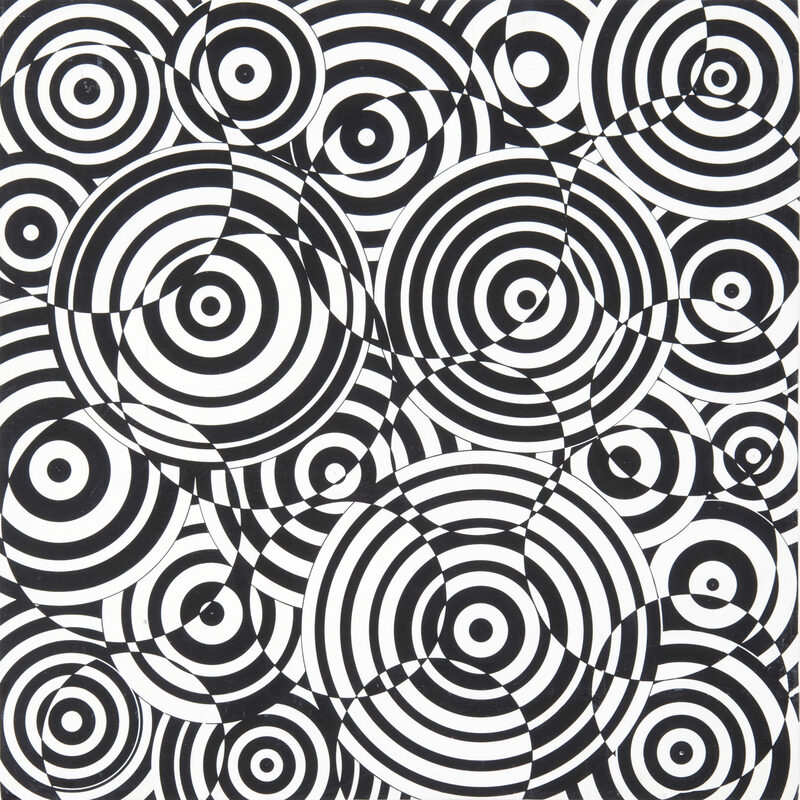 Influenced by Jesús Soto, he produced his first vibrant relief, Linéaire (1956). This was followed by a series of analogous works constructed from perforated metallic plates, superimposed on geometric compositions of bands, circles or squares that, when the observer moved, became powerfully active and created an endless number of optical and kinetic effects. At the end of the 1950s, Asís began to produce the series Interférences concentriques, groups of white and black concentric circles that, as waves in water, collided and superimposed themselves on each other, producing natural vibration between the colors. He would soon extend this aesthetic experience to multiple chromatic combinations, as seen in Interférences concentriques polychromes. Asís’s first Espaces couleurs carrés date from 1959. On planes occupied by small grids and colored according to strict rules the visual fragmentation of the surfaces’ sparkles and vibrates. Labyrinthe polychrome and Carrés rythmiques belong to this series. Asis’s experiments on the effects of combining colors and the resulting vibrations that distort perception continued with Quadrillages, in which the combination or superimposition of interwoven patterns and colors, from progressions of squares or circles, created an ambiguous and confused appearance of the structure of the work. This phenomenon also was created in series like Chromatismes quadrillés and Chromatismes quadrillés de cercles. Parallel to these investigations, Asís began to investigate the interaction of spectator with the work of art. At the beginning of the 60s, he developed Spirales, Réflexes, and Boules tactiles, in which metallic spirals, springs or spheres, made from cork, vibrated, responding to the viewer’s manipulation, thus generating a composition of movable elements. These movements were multiplied in some cases by positioning mirrors or geometric paintings behind them. Inspired by these ideas, Asís constructed installations like Chambre-Ballon, presented at the Maison de la Culture de Grenoble (France, 1968), in which five giant vinyl spheres mounted on springs vibrated and became illuminated when touched. The experimentation with concentric circles that began with Interférences concentriques continued with the series Cercles, which included, among others, the works Géométries spatiales and Sphères. In the former, the colors appear in concentric circles whose chromatic dimensions, resistance and separations generate manifold situations of depth and virtual movement. Sphères, on the other hand, depends on combinations of optical colors and the effects that emerge from one set of concentric circles. In 1971, with other Argentinean artists living in Paris including Leopoldo Torres Agüero, Armando Durante, Hugo Demarco and Horacio García -Rossi, Asís formed the Groupe Position. Like the Groupe de Recherche d’ Art Visuel a decade earlier, it was dedicated to optical-kinetic art. Group Position organized important exhibitions in several European countries, including a show at the Gallery Les Ambassadeurs (Zürich, Switzerland, 1972). Antonio Asís who lives and works in Paris, continues researching the themes and techniques that have inspired his artistic production. Atelier Antonio Asís – Oeuvres des Années 50 à 70. París: Hôtel Drouot, 1989. Pierre, Arnauld. Antonio Asís. Houston: Sicardi Gallery, 2007.